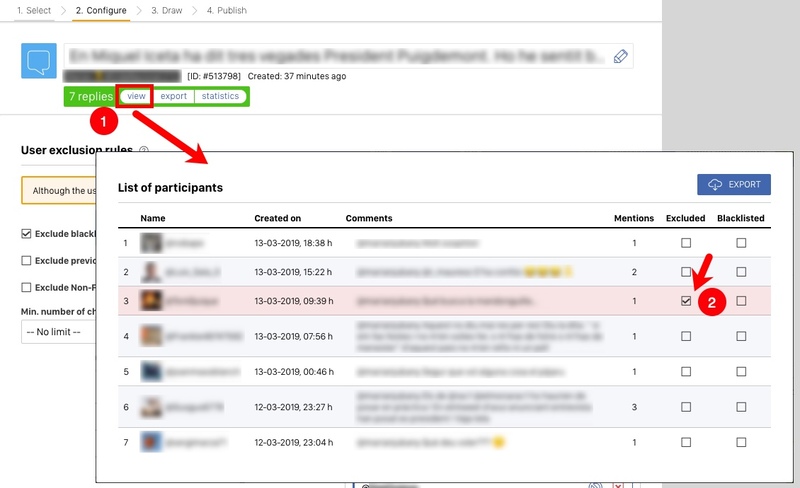 Even though a user participates with several replies, the system will only count one participation for that user. In case the user publishes several tweets, it will count as only one participation but the system will accumulate the different mentions of the user. This option allows you to limit the finalists to those who are followers of the brand. You can use the search box to find a specific user and exclude it from the draw. From the "Participants" section of the draw, you can view the list of all the users who participate, and you have the option "excluded" so that certain participants do not enter the draw. Option available only for Twitter Premium sweepstakes. By default, the application only selects as finalists those participants with a Twitter account who have at least 25 followers. If you want to delete this filter, change it to "0" and save the changes. You can also increase this minimum, always keeping the changes so that it applies. This option allows you to indicate the closing date of the draw, so that users who participated after this date do not enter the final draw. In this way, we make sure that users who have participated after the deadline will not enter the draw. 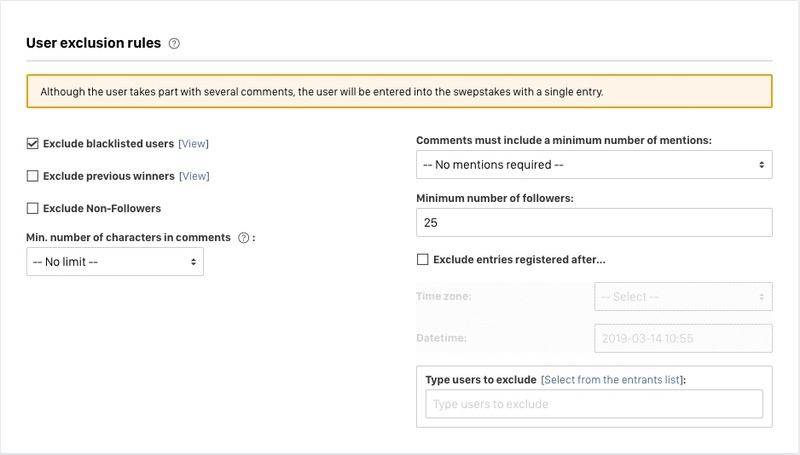 In the "Replies" and "Mention + Hashtag" sweepstakes, this option allows you to establish as a requirement that the users should include one or several mentions in the tweet or reply, so that the system will exclude the users that have not included the minimum number of required mentions from the final draw. Tip: Take advantage of this feature to ask users to mention at least 3 of their friends in their reply or tweet, and only if they do this they will enter into the draw for the prize. They can mention as many friends as they want and this increases the viral reach and the engagement of your sweepstakes. You can ask the users to include hashtags in their reply tweet to participate. The system will show you all the used hashtags and you can pass the users who have used one or more of the hashtags to the final prize draw. This can be a good idea in promotions that include predictions. For example: Reply this tweet and tell us with a hashtag who you think will win the oscar for best director: #spielberg #cameron #scorsese #tarantino.